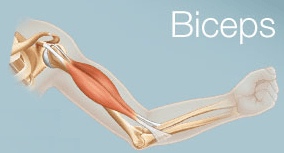 The biceps brachii, commonly known as the biceps, is a two-headed muscle located on the upper arm between the shoulder and the elbow, and is responsible for the movements of flexion (i.e. 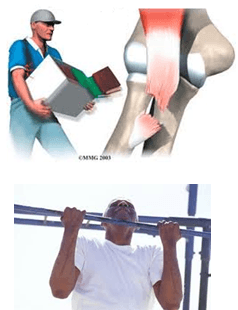 bending) and supination (i.e. rotating the wrist towards the ceiling) at the elbow joint. A biceps muscle tear injury signifies the rupture of a large number of muscle fibers, caused by an excessive contraction of the muscle in a violent or rapid manner. 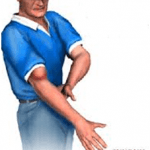 Symptoms of a biceps muscle tear include a sudden sharp pain felt at the biceps muscle, which is present even at rest. There will also be presence of swelling and bruising and sometimes an audible pop or snap will be heard during the occurrence of the injury. Important weakness in the arm might also occur following a biceps muscle tear. 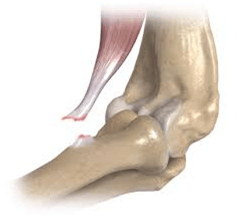 It is important to note that a medical follow-up will be necessary in conjunction to the physiotherapy treatments in order to determine the necessity of anti-inflammatory medications or of a medical surgery. The physiotherapy treatments will aim to reduce the pain and inflammation present with the use of electrotherapy (such as ultrasound and TENS), ice and proper education regarding the activities that may worsen your condition and thus that should be avoided for the time being. Your therapist will also use a wide array of manual therapy and myofascial release techniques, and will prescribe appropriate stretching and strengthening exercises.